Just north of Taos, New Mexico in the village of El Prado several vintage vehicles are artfully strewn as a kind of lawn decor. 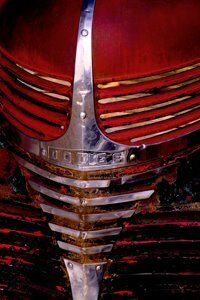 Among these treasures is the front end of a Dodge pick-up truck from the late 1930's. It's grill or shield glows Darth Vader like against it's burnished red paint. It's handsome, menacing and decaying all at the same time. I like it, great colors and graphically very strong.